Our Premium Extra Clear Melt and Pour Soap Base is transparent with a clarity score of 9 out of 10. It is our best-selling soap making base and has a creamy lather with big bubble foam. The two-pound tray is the perfect size container for projects making (8) 4 oz. bars of soap. The lid allows for unused soap to easily be stored for future use. COMMENTS: Great quality melt and pour base. Its extra clear just like it says. "Premium Extra Clear MP Base"
COMMENTS: This base is perfect for making spring flowers in my silicone mold. Using the lovely WSP Stained Glass Colors makes a delightful "Bouquet of Soap Flowers." COMMENTS: Very clear base. Made wonderful clear soap which I used as gifts. My family was very happy with the lather. COMMENTS: I loved how clear this soap base was it set up easy and very easy to use I will definitely purchase this base again!! "Like this a lot "
COMMENTS: Love this for my crystal clear soaps and to make imbeds for my cold process soap. COMMENTS: Love how clear this soap is. Have no problems with cloudy in inbeds. COMMENTS: This soap base was very easy to work with and my soaps came out perfect. I'm very pleased. • My soaps turned out great! COMMENTS: I like this soap base for creating my soaps and sugar sugar scrub cubes. Exactly what I expected in quality. "Premium extra clear soap base." COMMENTS: Handy trays for small projects. COMMENTS: My favorite clear soap, it takes color super well and doesn’t sweat easily! Will definitely be purchasing more when I run out! "Love how clear it is"
"Extra clear MP soap base"
COMMENTS: This base is a really nice, high quality soap. I'm very pleased with it every time I purchase it. Easy to use with color and fragrance. "Premium extra clear MP soap base"
COMMENTS: I have been using this base for a few years and love it. I like how it takes color well--the color always comes out bright and sharp. I like to use this base to make embeds for more opaque soaps. This one is a winner and I will continue to buy this base. Love it! 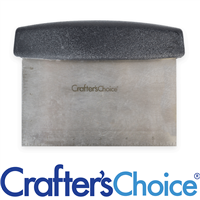 "Crafters Choice™ Premium Extra Clear MP Soap Base "
COMMENTS: Very clear and easy to work with. COMMENTS: Worked great in my shampoo bar, lot's of wonderful lather. COMMENTS: I love this soap base. Perfect for making embeds and pretty soaps! So easy to work with! COMMENTS: I love this soap base for my lemon soap bars. COMMENTS: works great & melts perfectly - can't go wrong with this! "First foray into melt and pour"
COMMENTS: We make cold process soap using all natural ingredients. We wanted to try melt and pour, so we ordered this product. I am sure glad we did. It was very easy to use, even for our first try. We mixed two batches, one canteloupe colored and one light green adding Cucumber and Melon fragrance oil. Did a little swirl, poured 2 ounce bars and sold out immediately. It makes a good amount of lather and is very clear. COMMENTS: Nice and clear. Perfect for using with water soluble paper. COMMENTS: When it comes to fancy soap the clear base is what you need! "Premium Extra Clear Melt and Pour Base"
COMMENTS: Purchased this to experiment with different projects. This base was great way to complete some different experiments. I used it to make both sugar and salt scrub cubes and to make my first soap (a lavender and oatmeal bar). Was totally impressed with my soap...the oatmeal sank to the bottom and the lavender floated to the top making an awesome bar of soap! COMMENTS: Can see decorative items in the soap.if starting out this is a good one to try. COMMENTS: Really have nothing bad to say here. Does what is suppose to. Love that they are in convenient 2 lb trays for smaller projects. COMMENTS: I use this in a solid sugar scrub. Great product, easy to use...will definitely continue to order! "Great scent , best clarity"
COMMENTS: Nice clean scent without fragrance added & great transparency! Will buy again! COMMENTS: Easy to use, great clarity. Best I've used! "Customers LOVE the Mechanics Scrub "
COMMENTS: I use this soap in the Mechanics Scrub and my customers love it. It is also an ingredient in some mousses and body scrub recipes on WSP and I can't wait to try it in those recipes. COMMENTS: Not sure if this batch was to blame or if it is characteristic of my environment but this particular shipment of extra clear just sweat profusely. More than any other batch I have gotten before of clear. Could just be a bad batch. COMMENTS: The melt and pour worked wonderfully for the embeds I needed! Nice quality melt and pour! COMMENTS: This MP soap base is so clear and perfect, when you add a gift inside the soap like a little duck or animal to make kids soap, it shows up nicely and doesn't look foggy or blurry... I love that you can see the actual little animal or things you put into the soap... including other kinds of colored soap or inbeds! "Clearest Soap I've Ever Seen"
COMMENTS: I love this soap when you need something absolutely clear. I made the snow globes with this soap and it is just so cute!! Everyone love it. Anything you want to be seen through the soap, this is the soap to use. Love, love, love it! COMMENTS: Peels off very easily and melts nicely. No sweating noticed. Definitely repurchasing. COMMENTS: Purchased for M&P embedded soap. Worked great and was very clear. Will be. Purchasing more. COMMENTS: This is true to its name...it turned out very clear....a great choice when you need CLEAR! COMMENTS: I use this product for my sugar scrub recipe as well as bars of soap. COMMENTS: I would rate the clarity on this as excelent! I will order this base again! COMMENTS: Love the clarity and ease of use. Great base! COMMENTS: We used this soap base to make multi-layered soaps for our children's teachers as end of the year thank you gifts. The soap is great and takes color well. It layers nicely and the teachers loved the finished products! COMMENTS: I used this to make a scrub and absolutely love it! 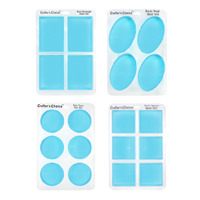 "Premium Extra Clear MP Soap Base - 2lb Tray"
COMMENTS: This is my most used base and I have tried other clear MP soap bases and this brand by far exceeds the others I have tried. It accepts fragrance an colors wonderfully and continues to give me consistent results, order after order. COMMENTS: Will purchase again! Leaves a wonderful lather! COMMENTS: I used this soap in the vanilla sugar scrub and i will be purchasing again for the same reason. COMMENTS: For special recipes calling for extra clear soap, I use this and am never disappointed. Wonderful soap. COMMENTS: Works great with many recipes and is a must have at all times. COMMENTS: This clear base dries super fast, so be ready to leave your mold still. I'm not a fan of the clear, as I like the white, goat's milk, and oatmeal, but this melts evenly, colors well and is good in "artsy" soap projects. COMMENTS: I used this for your beach glass soap recipe and they turned out perfect! COMMENTS: The sky's the limit with this one! COMMENTS: Great clear base. I use a lot of it. Favorite way is to suspend soap flowers (such as a rose) within the clear soap that has a gentle tint added. I have also made tiny soap seashells with a white base soap , tint the clear soap with a light blue color and suspend the seashells inside. I have no trouble suspending the items right where I want them, and really like this a lot better than the suspension type base. "Really enjoy using this! " COMMENTS: The premium clear in my opinion is better than the regular clear and I have no issues working with it, colors comes out great! Holds scent well and easy to use. You can also get it super clear with a spritz of alcohol. COMMENTS: This soap is fun to use. It is extra clear and clear enough for embed papers. I mixed with colors and it gives a beautiful clear color and some opaque depending on the type of colorant used. The finished product carries fragrances well (a little fragrance goes a long way). The lather is nice and bubbly. I will order again. COMMENTS: I make cold process soap and occasionally,create embeds to enhance my design work. Very easy to use and sets up rapidly. Can't ask for anything better. COMMENTS: I have been using this to make embeds to use with cold process soap. Great to work with. "Great melt and pour "
COMMENTS: Extra clear means extra clear here. I have ordered from other distributors that calls their clear base extra clear and it is not. Truly this is clear. I love it. "Premium Extra Clear Soap Base"
COMMENTS: Love love love this base. It is so versatile and the final product so moisturizing. I have used it in layered melt and pour soaps and the clarity is beautiful. Will always come back for more of this! COMMENTS: always a great product. I do only Melt and Pour soaps and this soap is great. COMMENTS: I have used many clear MP bases and this is by far the best!!! "First time trying it and I love it"
COMMENTS: I have never used this product before and I am not disappointed in the out come of the hand scrub. It definitely added an extra kick to my scrub. COMMENTS: I used this to make some seasonal greeting card soaps with water soluble paper and it performed wonderfully. I also used it to make some solid sugar scrubs. Holds up very well. COMMENTS: This base is as advertised, extra clear. It works well for complex color schemes for MP soaps. The lather is average, typical of MP soap base. 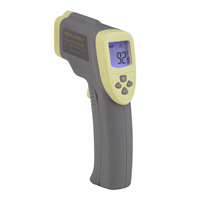 It does have a slight odor, which is normal, but is easily covered by your oils. "perfect for making designs in different colors"
COMMENTS: My favorite clear base. Great for suspension and price! "extra clear it is ....."
COMMENTS: This is the perfect base. Embeds and additives look great when you use the base. COMMENTS: I love this Clear base. It's wonderful to work with and so easy to use. "Extra clear MP soap "
COMMENTS: Used this for my pumpkin lager soap with the matte brown, awesome results. COMMENTS: This was so easy to work with! This came out of the molds I used very easily and with the liquid colors that I used my final products turned out great and are a huge success with my customers! COMMENTS: Love this soap base. Melts well, pours evenly. Packaged well. Would order again. Love this product. COMMENTS: This was amazing. It melted perfectly!! Great seal-able packaging!! "Premuim Extra Clear MP Soap Base"
COMMENTS: Just as crystal clear as I was hoping for. Wonderful product. COMMENTS: Yes, this soap is just as stated, super crystal clear, great for children's soaps. COMMENTS: Used in loofah scrub soap bars and gives a good quality to ...holds fragrance well! COMMENTS: Great clear base to use in soap when wanting bright, vibrant colors. Very clear and not yellow, good for embedding and layering and easy to work with. It's also easy to cut in a large block with a taper knife (get one at home depot), which is a major plus! COMMENTS: Such a great product! Mixes well with colors and holds fragrance. COMMENTS: Base stays extra clear and stays "liquified" at low temps making it very easy to work with when making multiple layers, swirls or intricate designs. Not having to heat the base up every minute so that it remains fluid is a BIG positive!! I just wish these bases were more natural than they are but if you want an extra clear base that remains fluid at low low temps than this us for you! COMMENTS: I used this and embedded things inside. It does well. COMMENTS: End products come out really clear and no problems getting mold to release. COMMENTS: I love this base, very clear. It takes color and FO very well and has a nice, rich lather. COMMENTS: I use this for straight glycerin soaps and in the sugar scrub kit I purchased through this site and love it! I will continue purchasing large volumes of this soap base! COMMENTS: This stuff is the best!!! COMMENTS: I use this soap in my scrubs, it has a very good consistency and no odor to disrupt any fragrances used. COMMENTS: This clear MP base melts easily & seems to hold scent well. It does not have a yellow cast to it like other "clear" bases I've used. I'm quite happy with it. "Great Product Crystal Clear like glass!" COMMENTS: Great Product Crystal Clear like looking through glass! Easy to use and produces quality products. Great for embeds. COMMENTS: Premium Extra Clear MP Soap Base - 2 lb Tray, love this base. Very easy to use. COMMENTS: My only problem with this soap and the others is that I do not have enough time to make all of the fun soaps that I want to! The possibilities are literally only as limited as your imagination. Thank you for this clear soap, so many ideas-very excited! COMMENTS: Love this soap base so much. This soap base is very clear and really lathers nicely. Definitely one of my favorites. COMMENTS: I use this soap base for my fish in a bag soap. works great and the fish can be easily seen in the soap. One of my best sellers.
" Crafters Choice™ Premium Extra Clear MP Soap Base"
COMMENTS: Great Soap Base, Lathers quite well with good amount of Bubbles, it also rinses off quite well leaving no greasy feeling, leaving your skin feeling squeaky clean, Customers loved it with a lavender scent also I added Hemp Seed oil. COMMENTS: I've purchased this soap base several times now and will keep coming back for more! It's easy to use, it's friendly and cooperative with the fragrances and additives I've used and gets along very well with other soap bases it's mixed with. It also lathers well, leaves skin feeling clean and moisturized according to my customers, makes beautiful loofah soaps and gives my "Get 'R Done" workman's scrub a wonderful base. It's one of my favorite playmates with lots of new adventures ahead! COMMENTS: I like Premium Extra Clear MP base. It performed nicely. I will be buying again. "Clear is not always clear"
COMMENTS: I've used this Premium Extra Clear MP base as a clear pour and it sets a little cloudy, but clearer than others I have tried so its my preferred clear. Its also great for creating strong and vibrant colors, and I'm all about that color! COMMENTS: This soap is nice and clear. No problem seeing additives in this soap. COMMENTS: I like this melt and pour very clear easy to color and takes fragrance very well. Just want I need , will order more of the melt and pour again. COMMENTS: It is very clear. "Sometimes clumps up after melting"
COMMENTS: I use this for my scrubs... it works well except there are time when after cooling down it clumps leaving small hard pieces in my scrubs. "Premium Extra Clear MP Soap Base - 2 lb Tray"
COMMENTS: I love this base! For some reason is actually sweats less than the detergent free base I got with this one. Will be buying this again!! COMMENTS: This is my go-to soap base. I use it in most of my MP soaps. It lathers beautifully. Some of my men customers even use this soap base as a shaving soap. COMMENTS: The only other M&P base I've used so far is from a craft store. I think this product is far superior. COMMENTS: I received this with a kit. I wish I could have had the option to swap it out for detergent free. The premium bases are nice, but I really don't find a difference in lather between them and the detergent free bases. COMMENTS: Easy to use and makes great products. COMMENTS: This is as clear as you can get! I love using this soap as a skim coat on top when I'm working an intricate design, to keep everything in place. It's great if you want a little sparkle on the very top, and not all the way through, just add a touch of glitter to your skim coat. Super easy to work with, I will always have this one in stock. "Easy to use!! Excellent product!" COMMENTS: Very easy to use and takes colors very well. Leaves skin soft!!! COMMENTS: I really like the way this soap melts and is easy to use. I love putting just a touch of color in the bars and they look like jewels. This soap also lathers well and does make your skin feel good after use. 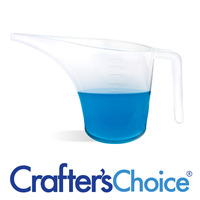 "great for crystal clear bright soaps"
COMMENTS: Love this for making my jewel tone soaps. COMMENTS: I LOVE this clear soap, especially for making embedded soaps, colors shine like stained glass, and comes out of the molds very easily and doesn't sweat. COMMENTS: I'm new to making soaps. Its pretty easy to make. COMMENTS: I was making little "fish" bowls. This is the only melt and pour that stays truly clear. Be careful adding any scent, you may cloud it up. I buy this all the time. "A fabulous clear soap base!" COMMENTS: WOW! This is by far the clearest soap base I have yet found - no bluing required, which is a relief because with other soap bases, I'd inevitably add too much blue to the base and was terribly disappointed to then have a pale blue instead of a clear soap base! The quality is very apparent as well. COMMENTS: I like the extra clear base but do not always use all of it at one time so keep it stored in the 2 pound containers. The last order I received did not have close fitting containers and the tops came off during shipping. "Craters Choice Premium Extra Clear MP Soap Base"
COMMENTS: I will use this again. COMMENTS: When Wholesale says its extra clear, they mean it! I love my stained glass colors with the extra clear base! A little does go a long way. "Stays clear for a long time"
COMMENTS: Great melt and pour. Low sweat. If you want to make it even clearer add a tiny drop of liquid blue pigment. COMMENTS: By far, the clearest MP Soap base I have used so far. I just ordered more. One of my favorite products from WSP! COMMENTS: Its color is great, and mixes will with everything. I use it with Sugar scrubs and scrubs I make for men, and everyone loves them. COMMENTS: This product stays smooth even at a relatively low temperature. Seems to harden up a little faster than others we've tried. COMMENTS: I use this soap by itself and as an ingredient in other products. It has a great consistency, lather and leaves your skin feeling smooth. COMMENTS: Good soap base. Customers regularly comment that they love the lather is produces. Holds color very well. I like it a lot. COMMENTS: I love feel of this soap and it melts down really well. Definitely my favorite clear mp so far! 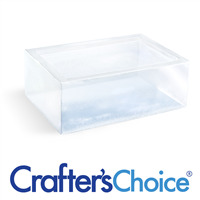 "Crafters Choice Premium Extra Clear MP Soap Base"
COMMENTS: This MP soap base is exactly as advertised! I was making snow globe soap, and I needed it to be crystal clear because I put a little "ornament" inside. The first batch I made, I sold out! Great product. COMMENTS: This is very clear base! If I want a shimmery mica powder to shine through my soap, this is the one to use! I only gave it 4 stars because I wish it was more natural. COMMENTS: Love this Extra Clear Base. Works well in the Mechanic's Scrub hand cleaner I make. Very clear in M&P soap therefore it colors beautifully. "wonderful for crystal clear soap"
COMMENTS: Try this base with the stain glass color bars-you won't be disappointed-holds fragrance nicely, too. COMMENTS: This is the best base around when you need a great quality base that is pretty much as clear as it gets. COMMENTS: this is one of the clearest bases I've worked with, and it still lathers well and unmolds very easily. will purchase again! COMMENTS: I like this brand the best. It really shows off my fun designs in the middle. "Fantastic base, the clearest I've found." COMMENTS: Super clear and easy to work with. This is one of my new go-to bases. Lathers great! "Easy to use resulting in a great product." COMMENTS: This is the first time that I have made soap. This product was easy to use and had great results. The soap carries sent well and gives a smooth surface. COMMENTS: I have high standards when it comes to clarity and the yellowing of soaps so I'm a bit fussy. Hands down though, this one is simply unbeatable! Anything that I have added to it, from colorants to toys looks remarkable! I used to buy from the big craft stores before I found WSP, and when I compared soaps, the others were either hazy (and marked "extra clear") or they were yellow, like old book yellow. I will never again purchase from anywhere else, even if that means I have to put off a project until my next shipment arrives. "Now I see why this is a top seller"
COMMENTS: I like this product a lot. I use it for soaps and also in Debbie's Best Peppermint Sugar Scrub. Wow! Customers went crazy for it and I must admit; I love it myself. It will remain a staple in my soaping supplies. I'm just sad I missed the most recent flash sale on it!!! COMMENTS: This is a great soap base with lots of bubbles. Colors, fragrance, embeds, and other additives work very well in this base. Very easy to melt. COMMENTS: I use this in the mechanics scrub that I make for the guys in my family. It melts easily, mixes well, holds fragrance well. It is a vital ingredient in the scrubs, and the men in my family love it and want more. I will be buying more for scrubs and clear bars. COMMENTS: i love this when i am adding color i love making layered mp and this is excellent. very clear just what i needed. "Used with White Sparkle Color Bar"
COMMENTS: I wanted to make a bar that looked like sugar. This is crystal clear and blended well with the White Sparkle Color bar and Iridescent Glitter. My loaf was a total success! Topped it with multiple colors all chopped up to look like sugar candy. Beautiful! I highly recommend using the Crystal Clear base for light colors. COMMENTS: Nice results for soap. I also use this in other products too. COMMENTS: This product is perfect for a variety of projects. Beautiful results. Holds color and scent well. Great for kid/family projects. COMMENTS: I used this mostly for creating soap curls for my soap loaves and I can't see myself using another clear base for embeds. I was pleasantly surprised of how clear it actually was and how beautifully my added colorants turned out.